Insulated rain screen panels SAF – Southern Aluminum Finishing Co, Inc.
Villa Rica, GA – March 2, 2017 – Southern Aluminum Finishing Co. (SAF) introduces 4000i Insulated Rain Screen Panels as an addition to their ADAPT Panel and Column Cover Systems Accessories line. The 4000i is essentially an SAF 4000 Series Rain Screen ACM, aluminum, or stainless steel building panel with insulation adhered by silicon sealant that meets use ‘G’ and ‘O’ of the ASTM C1184 standard. The type of insulation and R-value is customer specified. SAF recommends mold-and water-resistant insulations such as mineral wool or Polyisocynurate (Polyiso), available in a wide range of R-values. Architects and design build contractors can reduce building energy consumption while improving performance with 4000i Insulated Rain Screen building panels. Energy codes like ASHRA 90.1 have encouraged architects and building owners to specify insulated panels for both exterior and interior applications to reduce energy loss. 4000i Insulated Panels help in noise abatement applications, as well. SAF Rain Screens are drained and back ventilated panel systems that incorporate strips of composite or aluminum material in reveals between each panel (instead of caulk), resulting in a more uniform appearance. 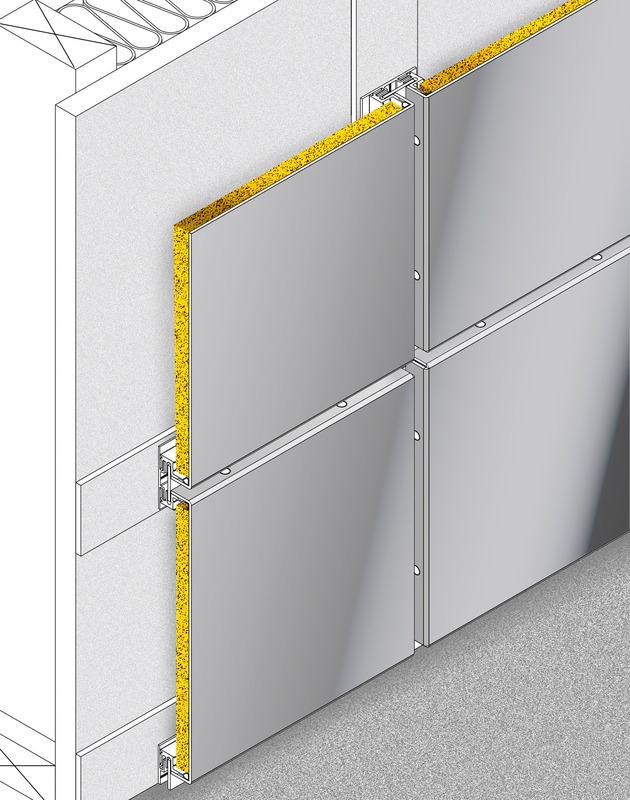 Custom 4000i Insulated Rain Screen Panels include aluminum “track” extrusions for wall mounting. The 4000i Insulated Rain Screen Panels are designed to meet all the same building construction code specifications as other SAF 4000 Rain Screen Panels. While Florida Building Code and High Velocity Hurricane Zone (HVHZ) testing has not been performed with the insulation, SAF says the addition of insulation does not materially change structural, air, or water handling properties of the panel system. SAF project managers are available to help customers with questions about rain screens and specifications, while their network of engineering firms can consult on local building code requirements, structural calculations and conduct job-specific performance testing, if required.